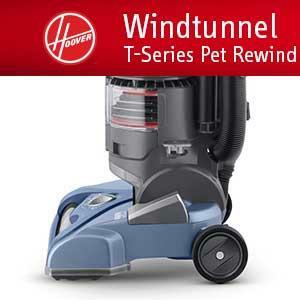 Rewind tough pet messes with the T-Series WindTunnel Pet Rewind Bagless Upright. It features an easy cord rewind, folding handle, no loss of suction*, 5 position carpet height adjustment and the easy-to-clean Air-Powered Pet Hand Tool for hands-on cleaning. The 8 ft. stretch hose gives you instant access in tight spaces while a carbon filter absorbs pet odors. Then empty the Convenient Bottom-Release Cup without getting your hands dirty. On Carpet, Per ASTM F608.